SIGNED BREGUET, NO. 449, SOLD TO SIR DINSHAW PETIT, 20 AUGUST 1924 FOR 6500 FRANCS. 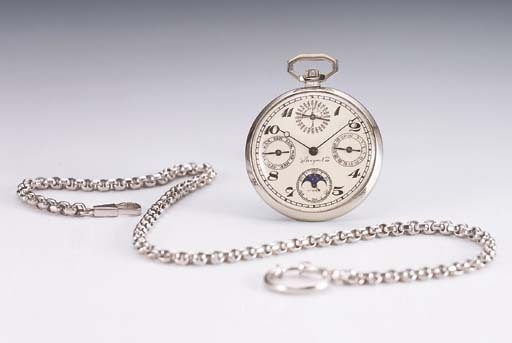 nickel finished 18-jewel movement with straight line lever escapement and bimetallic compensation balance, mat silvered dial with Breguet numerals, outer minute track, day, date and month dials, subsidiary seconds with moon phase aperture and blued steel hands, circular three piece case with fixed bow, white gold fancy link chain, dial, case and movement signed. This watch was lot 134 in "THE ART OF BREGUET", Antiquorum, Geneva, 14 April 1991.